Dr. Yi Cui of Stanford University has expanded the idea of “battery” to include conductive ink on paper, fruit-like clusters of energy-storing capsules, and now, nano-sized graphene cages in which the energy can romp like a hamster in a plastic ball. He will be on hand at this year’s Sustainable Aviation Symposium on May 6, at the Sofitel San Francisco Bay hotel. His pioneering work with silicon as an electrode material goes back at least ten years, and has focused on overcoming silicon’s two major problems in battery use. Silicon expands and begins breaking down during repeated charge-discharge cycles. It reacts with battery electrolyte to form a coating that progressively destroys performance. The combination of crumbling and coating finally makes the battery inoperable. His group at Stanford had found a way to “wrap every silicon anode particle in a custom-fit cage made of graphene, a pure form of carbon that is the thinnest and strongest material known and a great conductor of electricity. The team created a three-step way to build microscopic graphene cages large enough to let the silicon particle expand during charging, but tight enough to hold the particle together if it does crumble. That maintains functionality at high capacity. The cages are also barriers to electrolyte getting in and coating the anodes. Looking a “great deal” like the pomegranate batteries Cui and his team developed two years ago, “with silicon nanoparticles clustered like seeds in a tough carbon rind,” as Phys.org reported, the graphene cages may be a significant improvement over the 2014 configuration. 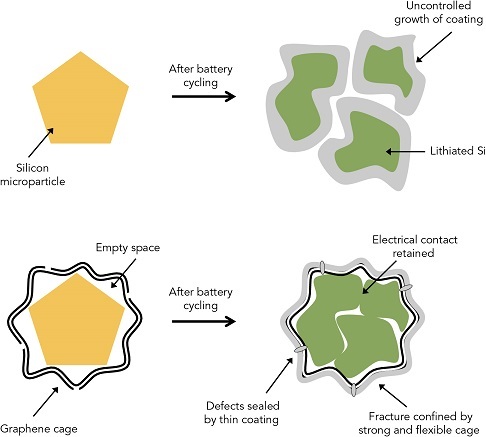 Encapsulating silicon anodes in graphene cages allows the anodes to flex, break, and be kept together within the cage – maintaining electric contact and the ability to charge and discharge. It’s a counter-intuitive approach, allowing the purposeful disintegration of the anode rather than trying to hold it together as in previous approaches. To fit the cages to the anodes, or vice-versa, SLAC personnel coated silicon particles with nickel in “just the right thickness.” They then grew layers of graphene on the nickel, which turns out is a catalyst that aids graphene growth. They finally etch the nickel away, leaving space inside the cage for the silicon particle to expand. That all this takes place at a nanometer-sized scale leaves one more than slightly astounded. The team is now working on optimizing cage sizes and devising ways to grow enough of them to make commercialization possible. Other researchers contributing to the study were Stanford’s Hyun-Wook Lee, Zhenda Lu and Nian Liu. The research was carried out by SIMES, the Stanford Institute for Materials and Energy Sciences at SLAC, and funded by the Battery Materials Research program of the DOE’s Vehicle Technologies Office. The Nature Energy paper by Yuzhang Li, Kai Yan, Hyun-Wook Lee, Zhenda Lu, Nian Liu, Yi Cui, “Growth of conformal graphene cages on micrometre-sized silicon particles as stable battery anodes” can be viewed gratis, a rarity in scientific publishing.